How Can a Mechanical ‘Cardinal’ Make ‘Selections’? But what about birds: can they be spectators? What about fake birds: can they “select” when to sing? This unusual bird-watching report begins with a “no-brainer” observation that most birders already know well: we humans like to watch birds! The Northern Cardinal (Cardinalis cardinalis), a/k/a “redbird” is a beauty to behold – and to hear. 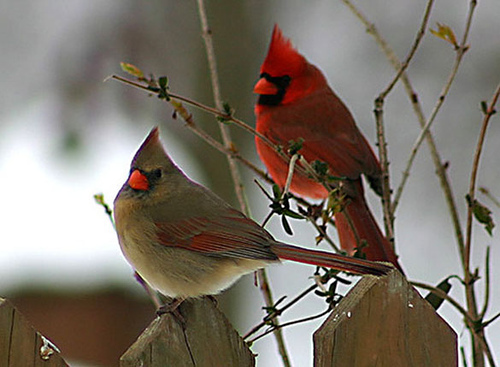 Cardinals are so highly appreciated that seven states claim it as their official state bird: Illinois, Indiana, Kentucky, North Carolina, Ohio, Virginia, and West Virginia! 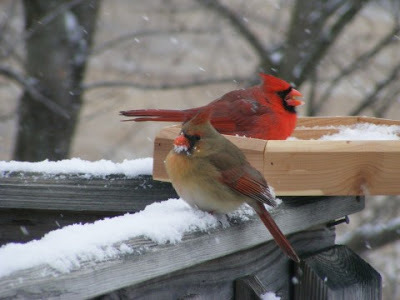 Cardinals are songbirds that are easily seen (especially the males), due to their colored plumage contrasting with the green foliage of spring and summer, — or with the bright white of winter snow. 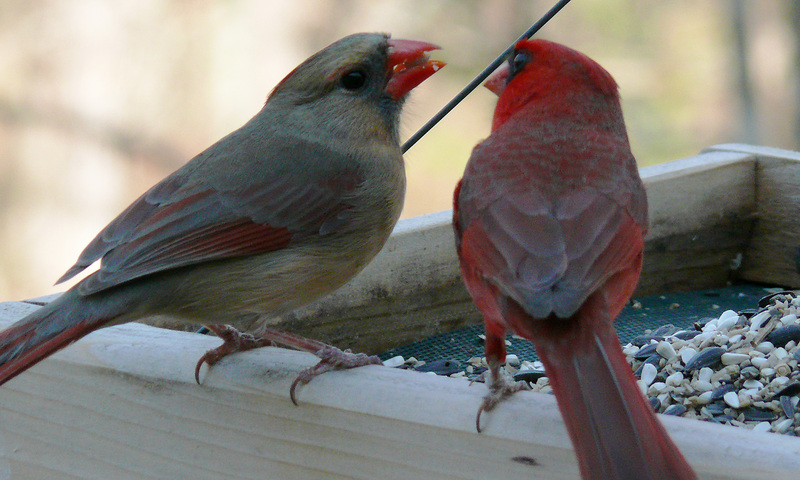 Surely a view of cardinals, eating safflower and sunflower seeds (or other cracked corn, peanuts, or even raisins! ), will make you wonder at God’s creative genius and love of beauty, when He chose to make (see Genesis 1:21) the male and female of that beautiful songbird species! But, could it be that birds also like to watch humans? And could it even be that mechanical “birds” appreciate humans who move around in front of them? Lately my wife have been having fun at my expenses, using a “toy” cardinal. The cardinal was given to her by Marcia Webel (of Florida, wife of Chaplain Bob Webel). 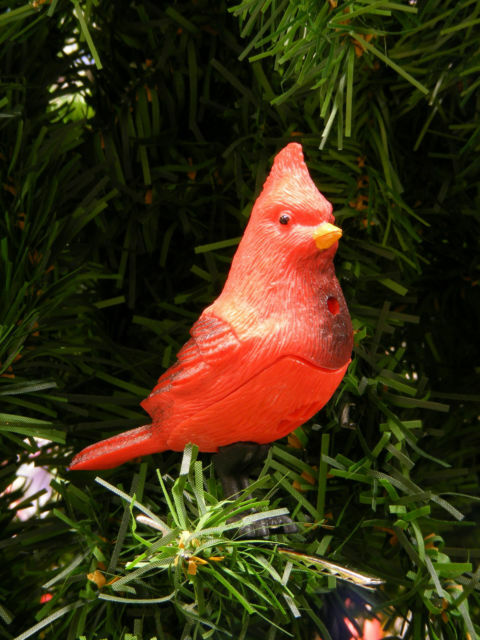 It is a smaller than life-sized bird shaped and colored like a male cardinal, and it can make “vocal” noises like one, too. But it is a “motion-activated” machine. In other words, it is “selective” in when it “chooses” to sound off its recorded chirping sounds (which do sound like a real cardinal). But it’s not really making decisions about when to chirp; it’s just a programmed machine that is designed with receptor features that sense motion nearby, and the inventor designed the machine to “trigger” its recorded sounds whenever its receptors “recognize” such motions. But here is the puzzle: my wife moves in front of the “cardinal” and he chirps for her, just like the toy’s inventor designed him to do. Then I dance (not in public, of course, — just in the privacy of our kitchen) in front of the “cardinal” and he is silent. Silent! So I dance again. Silent, silent! So I try a few Tae Kwon Do maneuvers (kicking, punching, whirling, bowing) – and he is still silent. If proving my body’s mobility was dependent upon the “cardinal” chirping I would be diagnosed as paralyzed or unconscious. 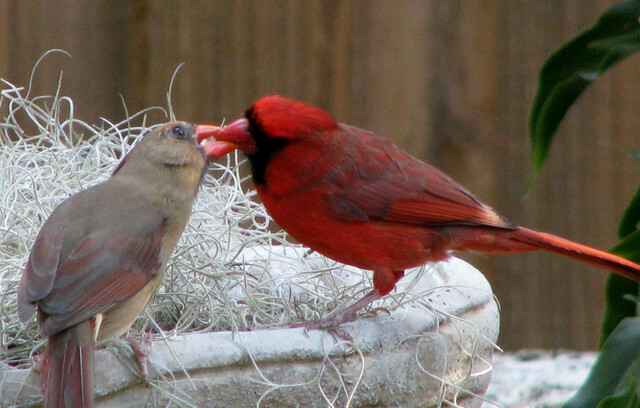 It seems like the “cardinal” is “selective” regarding which human he is “willing” to chirp for. But that can’t be, you say, and you are right. A lifeless machine – even one that looks like and sounds like a male cardinal – cannot really “select” anything. Maybe I don’t have the kind of “walk” that causes a mechanical cardinal to “sing”. As we all know, you need to have the “walk”, not just the “talk”. So who do you watch? If you only sang a song if and when someone walked in front of you, but not if he (or she) merely talked, who would you sing for? Meanwhile, as we move through this world, from day to day, are our own lives worth watching? This entry was posted in Birds, Birdwatching, Orni-theology and tagged Christian, Christianity, Deception, Evolution vs Creation, Home School, James J.S. Johnson, Mechanical, Natural Selection, Nature, Walk Their Talk. Bookmark the permalink. 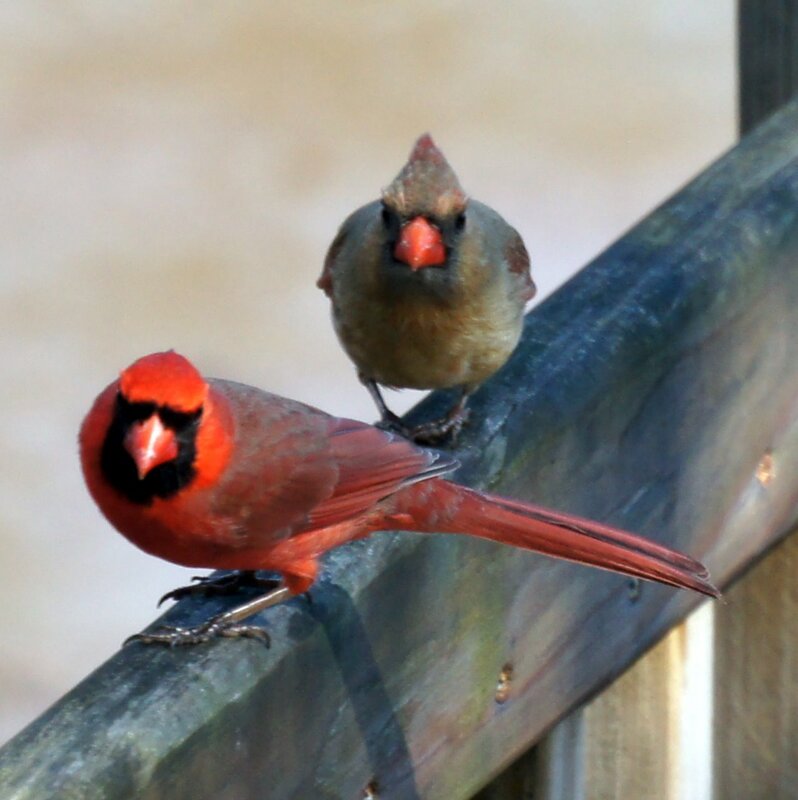 Beautiful photographs of the cardinals, Lee! Once again, thanks for all you do on this terrific blog-site! Only you can put those pieces together to create a great lesson.